In the handicraft field, the Molise boasts of noble traditions, like the one of Isernia receiving visitors with “the shy voice of its numerous bobbins” (Vincenzo Passatelli). Isernia can be called the laces town, as its main craft activity is the precious bobbin laces manufacturing. The laces of Isernia are renowned all over the world for two reasons: their ancient origins and refined manufacture. The bobbin lace art dates back to the beginning of the fifteenth century and according to the tradition, the Spanish Sisters of the Benedictine nunnery of S. Maria delle Monache spread this art among their convent girls. The first document, attesting the production of a lacework made by the nuns, dates back to 1503. Giovanna III Queen of Aragon, who owned the town of Isernia through the marriage with King Ferrante, loved these embroideries. Besides of being a great admirer, she wanted to practice this art guided by the women of Isernia. The laces of Isernia are renowned all over the world as worked with ivory-coloured and fine threads of domestic production which make them refined. 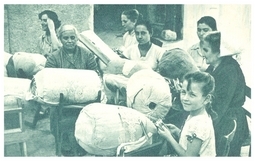 Still today, walking through the historic centre streets, you can listen to the characteristic tinkling of bobbins, skilfully handled by the women of Isernia.